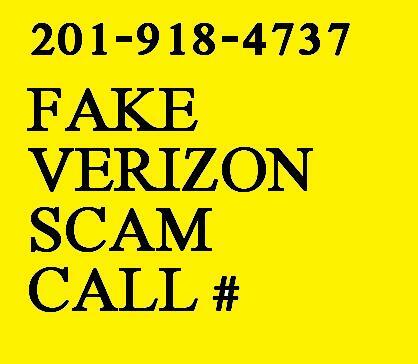 Many people in New Jersey are getting a call from this number – and they wrongly believe that it is coming from Verizon Wireless Collections. This is not true. According to Verizon Wireless, there is no such telephone number associated with any of Verizon’s departments. The caller is an electronic voice — sometimes male and sometimes female. Finally – “Press 4 if this number is not the number belonging to John Smith.” <– That is the number you should press — then hang up. Actually you should just hang up without pressing anything. Note that the voice is a computer so they will often mispronounce your name pretty badly. UPDATE: AS OF 30 JULY 2012, VERIZON WIRELESS HAS DONE NOTHING TO STOP THIS ASIDE FROM TELLING CUSTOMERS TO BLOCK THE CALLS BUT THAT MAKES NO SENSE SINCE THE CALLS ARE COMPUTER GENERATED AND THE COMPUTER SIMPLY CHANGES THE NUMBER BY ONE DIGIT. DO NOT WASTE YOUR TIME TALKING TO VERIZON REPS SINCE THEY DON’T SEEM TO CARE AND THE FRAUD DEPARTMENT IS ITSELF A FRAUD IN THAT IT DOES NOTHING TO PREVENT FRAUD OF THIS NATURE. This is a total scam — DO NOT FALL FOR IT!!!! DO NOT GET CONFUSED AND PRESS 3. Mind you, this should only apply to this number or any number you think is suspicious — in which case the best thing you can do is just hang up. Some other legitimate numbers may call and ask these questions and key prompts, but for the most part, this is the tactic of a cheapo sleezo collection agency. My investigation concluded that 201-918-4737 is either a collection company trying to gather data about you or a company that is composing an illegal list of names associated with cell phone numbers. Note how the the PRESS 3 question is worded. “Press 3 if you can call John Smith to the phone.” This is a tactic that has been used for over ten years by Collections and Scammers. There is a variant to question 3 where they ask, “Press 3 if you are unable to call John Smith to the phone at this time.” It’s a twist on the same psychological mind-confusing scam. A lot of people — even the most skilled bill collector dodgers fall for this question and nervoulsy press #3. Again, this SCAM number should be investigated by the NJ State Police. The best I could come up with was by calling a number smiliar to this and guess what I got — a COLLECTION AGENCY who denied having anything to do with Verizon Wireless — and the sleezy guy on the other end sounded REALLY nervous. Strange how a number so close to that one — and several other numbers near to that one, all lead to the same agency that MUMBLES its name — never could figure out what they were saying — REAL GRIFTERS!!!! I have gotten so many letters about this number over the past year that I decided to check it out — glad I did. So, if you get a call from this number, wait for the last prompt and deny that you are that person. It will in no way cause a problem with Verizon. MAJOR WARNING!!!! DO NOT GO TO A WEBSITE THAT ASKS YOU TO “REPORT THIS NUMBER” AND PRETENDS TO BE LOOKING OUT FOR YOUR INTERESTS! YOU WILL GIVE AWAY YOUR IP ADDRESS — THAT IS THE NUMBER THAT IDENTIFIES YOUR COMPUTER AND WHERE YOU LIVE WITHIN A 1/2 SQUARE MILE AREA. THEY MIGHT ALSO TRACK YOUR COMPUTER BY PUTTING COOKIES ON IT AND WATCHING WHAT YOU DO. DO NOT EVER REPORT THIS NUMBER FROM YOUR COMPUTER AND FILE AN ONLINE COMPLAINT TO ANYONE BUT THE REAL VERIZON WIRELESS. I AM LOOKING OUT FOR YOU!!! Zuckerberg Banning People Who Put Pictures Of Their Food On Facebook? Results of Justin Bieber Paternity Test Are In. You’re hysterical. It’s ironic this is on a site dedicated to “human stupidity and dumbness”. It’s a 100% legitimate call from Verizon. Nor is that what an IP address is, nor does an IP address uniquely identify your computer unless you have a static IP, which almost all home users do not. At *best* it may identify which cable company or ISP you’re using, in the most common case. How are things in Helmetta — the second most comtaminated city in New Jersey next to Manville?